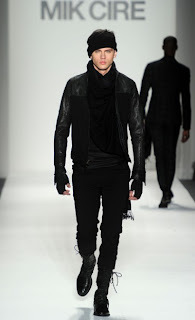 Mik Cire Fall / Winter 2011 is all about black, black and more black! So if you love black, I'm sure you'll find staple pieces to add to your wardrobe, including cashmere flannel coats and blazers, lambskin leather moto jackets, black cotton shirts, wool pants and silk scarves. WHERE THE F*** IS DENNIS JOHNSON HE IS THE BEST MODEL IN THAT RUNWAY AND YOU DON'T EVEN HAVE A PICTURE OF HIM. I chose my favorite looks here, not best models.